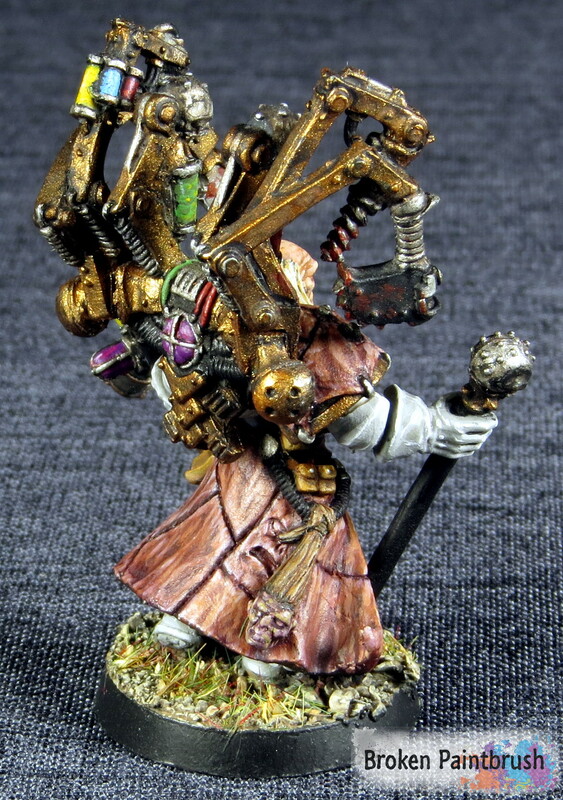 An oldie but a goody, Fabius Bile is a Games Workshop classic that I’ve had in my collection for over 15 years (crap that makes me sound old!). He has gone through a couple of iterations of paint schemes and his ‘enhanced’ warriors are back into bits pile in my closet, but I present the latest update to the classic. I wanted to pay some homage to his origins as a Emperor’s Children apothecary but still fit in with my Iron Warriors 14th Grand Company, so the armor was painted a dirty white and the shoulder pads black and silver. The flayed skin robe helps create the morbid color offset by the brightly colorful vials. 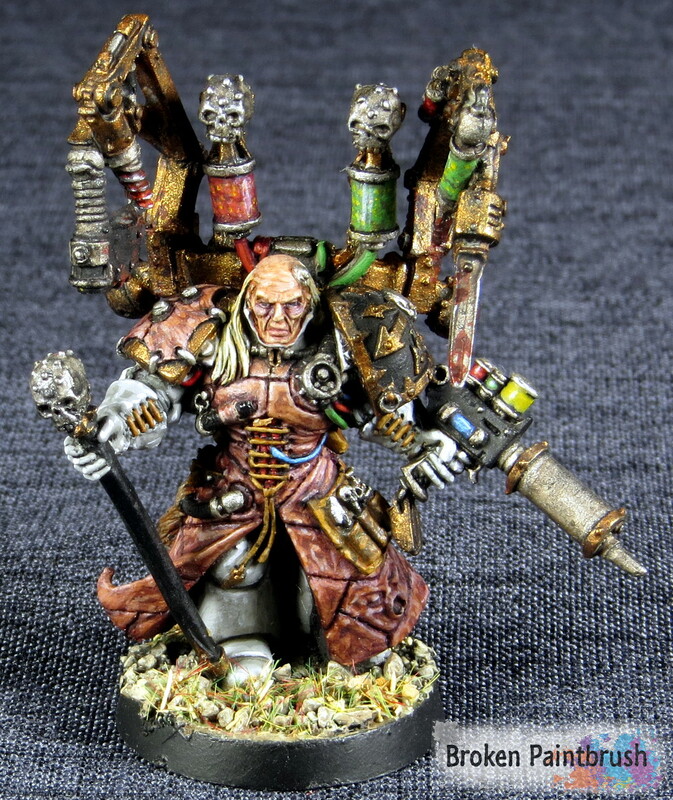 I’ve seen Fabius Bile’s Chirurgeon used on so many crazy conversions for great reason: they are epicly gruesome. 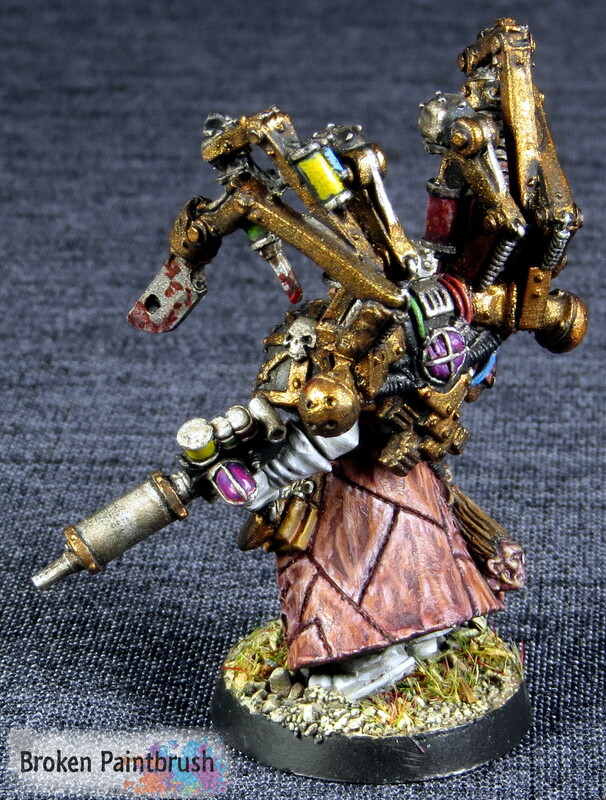 Between the chain blade, drill, butcher knife and syringe, it makes even a Ork Doc cringe. I wanted to give the backpack an old, worn look but still have it flashy as any Emperor’s Children would have it. Game wise, the newest edition of the codex took some of the fun out of the Enhanced Warriors (any one remember the 3rd edition rules?) but 5 strength 5 attacks with instant death isn’t something to be sneezed at – even if his power armor and feel no pain won’t hold up against the monsters he would be great at killing. I hope you like him and feel he does the classic some honor. As always, comments and suggestions are welcome!